The Federal Reserve raising the 25bp was pretty much expected throughout, with a few possible outlier exceptions. However, it was not really the hike that spooked markets, but that they had built-in so much belief that the no change in hiking rhetoric they was expecting. This is probably why markets are reacting so violently, as most believe their own hype that the FED was one and one. 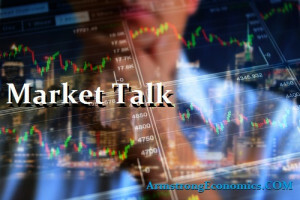 The Nikkei was dragged lower by banks, financials and pharmaceuticals, in a day where bids were chased lower with no signs of a bounce all day. The Yen also saw some flight to quality, but given we saw a 3% decline in the Nikkei the Yen bid was only a minor at just 0.8%. In late trading the safe-haven bid is finding its feet and sees the possibilities of a 110 handle print. The Shanghai index was also off -0.5%, whilst Hang Seng suffered a little more with a 1% decline. The supporting action by the Chinese central bank has helped confidence within the market, but the global slowdown is dragging on all geographies and all sectors. One market that suffered less than others today was the SENSEX (-0.1%) and that was probably saved only by the declining price of oil. The negativity rolled from Asia into European markets, with all opening on the weak side. Todays losses are taking core indices deeper into double digit losses for the year, with the DAX’s -18% leading the declines for the year. The UK FTSE did well in comparison, but even it fell 1%. GBP has balanced some of that decline, but could not make-up for it all. Mark Carney again hosted the Bank of England rate decision press conference and again warned of BREXIT uncertainties. Leaving rates unchanged, he then proceeded to reduce projected growth forecasts from ).3% down to +0.2%, expressing continued uncertainties. FTSE is still down around 13% this year whilst Sterling has lost over 6% YTD. However, its worth mentioning that the Euro itself has also lost over 4% against the USD this year. Interesting that as the selling progresses we are starting to see more of a pick-up in the VIX. Last seen trading with a 28 handle could be construed that hedging has started as positions are gradually built. The FED’s 2019 outlook was not what the market had priced in and so we are seeing the result of uncertainty. Todays pressure has taken the core down to February lows to levels not seen in 15 months. The US Treasury market gave a little of yesterdays rally back and has seen the steepening return. Lets see what Fridays closing numbers produce, but many will be checking headlines for the latest US/China negotiations. Japan 0.02%, US 2’s closed 2.67% (+2bp), US 10’s 2.79% (+4bp), US 30’s 3.02% (+4bp), Bunds 0.23% (-1bp), France 0.67% (-3bp), Italy 2.73% (-6bp), Turkey 16.09% (-12bp), Greece 4.25% (-1bp), Portugal 1.64% (-1bp), Spain 1.37% (-1bp) and UK Gilts 1.26% (-1bp).